 Please see the pictures of our meeting! Most participants stayed at the Hotel de Senlis, 7 et 9, rue Malesbranche (entre Rue St. Jacques et Boulevard St. Germain), 7505 Paris, hoteldesenlis@wanadoo.fr, Tel. 01 43299310, Fax 01 43290024, reachable by RER from the airport Charles de Gaulles at the Metro RER Luxembourg. The Maison des Sciences de l'Homme is 10 minutes by foot from the hotel, straight through the Jardin du Luxembourg. The Jardin du Luxembourg is probably the most popular park in Paris. It is located in the 6e arrondissement, near the Sorbonne University. The park, 224,500 square meters large, was designed in 1612 in French style. In the 19th century, the private park was opened for the public. The papers will be posted here as they arrive. Please ask the authors for their authorisation if you wish to quote them! Please find our Meeting Notes here, however, please be aware that they are not yet finished and in the process of being edited. Please see background reflections by Lindner, 2004, as short summary, and longer paper (not to be cited without author's authorisation). It is important to note, that Lindner's work, even though she convenes this meeting, is designed to stimulate interest and by no means meant to dominate this meeting. Paper presented at the Annual Meeting of Humiliation Studies, Maison des Hommes, Paris, 15th-18th of September, 2004, unpublished draft (not to be cited without author's authorisation), 2004. Paper presented at the 2nd Annual Meeting of Human Dignity and Humiliation Studies, Paris, France, September 16-18, 2004, unpublished draft (not to be cited without author's authorization), 2004. Please see Humiliation Experienced by Somali Immigrants in Norway, in Journal of Refugee Studies, 19 (1, March), 2006. Katrine developed this article from the paper she presented at the Annual Meeting of Humiliation Studies, Maison des Hommes, Paris, 15th-18th of September, 2004. Donald Klein and Linda Hartling set the frame of our meeting within "Appreciative Inquiry" and we create a list of agreed upon norms having to do with the nature and tone of our discussion together. Don explained (August 2004): "The term Appreciative Inquiry and the approach to organizational consulting and inquiry was developed by David Cooperrider at Case Western Reserve University. The approach is gaining wide usage among people doing organizational consulting. My work overlaps with David's approach. I'm using the term 'Appreciative Being' to describe a way of relating to life events via our human inherent capacity for experiencing awe and wonderment at being part of the universe." Evelin Lindner (please see background reflections by Lindner, 2004, as short summary, short table, executive summary, and longer paper). See also Newsletter Nr. 1 (Founding Issue), describing the timeline for HumanDHS until September 2004. Donald Klein had framed the spirit of this joint presentation as follows: "The joint presentations focus on where each presenter was left as a result of the meeting and each one's hopes and expectations regarding the 2nd annual meeting." Linda Hartling, Wellesley College, USA, lead a collaborative discussion that focused on the following topic: What are the individual and collective motivations as well as situational contexts within which individuals and groups are moved to attack others' dignity and inflict humiliation on target individuals or groups? Presentation by Donald Klein, Union Institute and University, USA, focussing on the following question: What can be done to create the safety, personal and collective significance, ready exchange of needed resources, and opportunities for celebration that, we presume, would reduce if not eliminate the potential for humiliation to occur between individuals and groups? 17.35-18.15 Somalis in Exile: Do Somali Immigrants in Norway Feel Humiliated in Their Meeting with Norwegian Society? 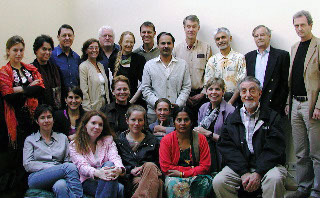 In our annual meeting in 2003, we felt that there was too little time for unstructured discussions. Therefore we decided to have Day Two in our 2004 meeting as a more unstructured day, not entirely filled with presentations. Therefore we had only a few short presentations in the beginning of Day Two and the rest of the day to our free disposition. Donald Klein explained the Open Space design as follows: "It would involve creating a kind of 'marketplace' of possibilities based on topics nominated by participants. The only requirement is that whoever nominates the topic acts as the convener of the discussion of the topic and takes responsibility for having notes taken, and a report made about the essence of what was discussed, including any conclusions or recommendations, at a plenary session following the topic groups. The Open Space design has the advantage of focussing on whatever is of greatest interest to participants at the moment. It allows for parallel discussion of multiple topics, followed by a period of sharing and general discussion. I believe it would be more productive than having 30 people engage in a round table discussion." 13.00 TV a Powerful Medium But for What Purpose? Presentation by Gerd Inger Polden, investigative journalist at the Norwegian Broadcasting Corporation NRK.  How does TV present humiliation?  Victims of humiliation - how are they presented? Presentation by Gerd Inger Polden of UNICEF's and Tostan's work, against female genital mutilation in Senegal. Molly Melching is the Director of Tostan. The International Association of Women in Radio and Television is a forum for personal contact and professional development among women broadcasters, worldwide. Through this network Gerd Inger Polden has met the Palestinian journalist Naheed Awwad. Gerd Inger Polden showed one of Naheed's films on humiliation of the Palestinians on the west bank.